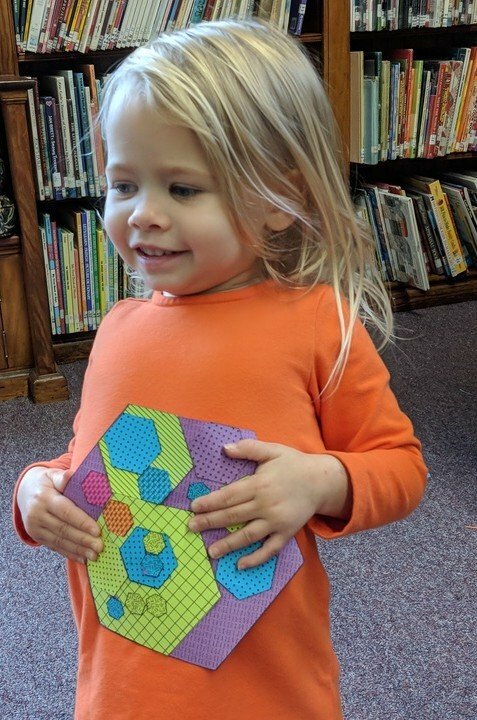 This past Sunday I brought some hexagons to a nearby library, where a homeschooling group was meeting, hoping to do some math/art. 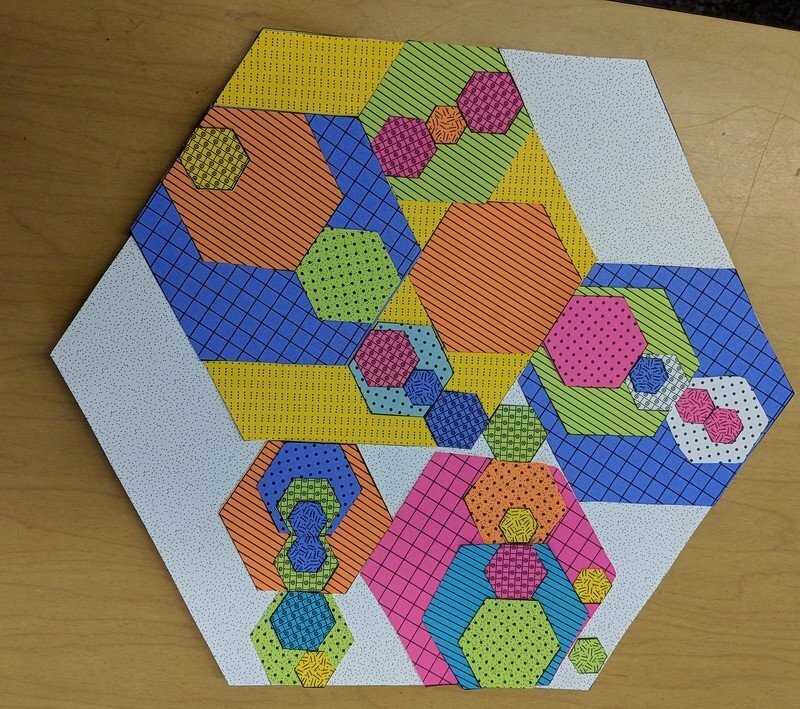 My thinking was to bring something that was playful, hands-on, and that combined visuals and math in a way that would be both engaging and instructive. 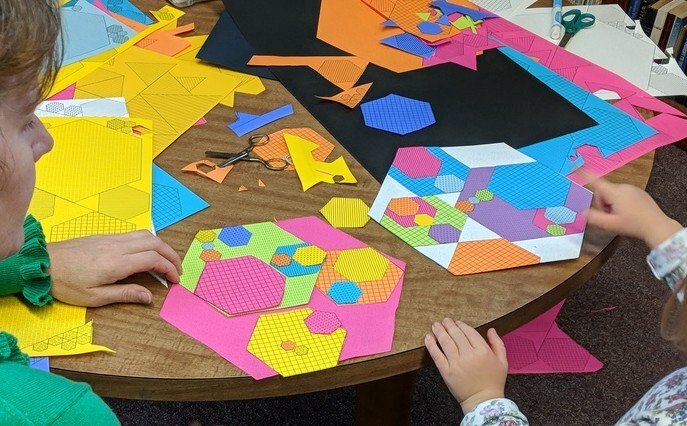 The woman who asked me to do this project had seen my post on circles and the golden ratio https://bookzoompa.wordpress.com/2018/07/03/sorting-out-the-golden-ratio/ and was looking for me to do something that explored this golden ratio idea with kids. The Golden Ratio is found in nature, and is a darling concept of artists, designers, and mathematicians. It’s also a tricky proportional relationship which is not easy grasp. I started out the session reading a definition of the golden ratio, and explained that, generally, the only people who understand its definition are people who understand it already. I let them know that my aim was to convey the message that if they are confronted with a difficult idea, a great way to move forward is to play with the idea. Just play. The spectacular thing that happens to shapes that are scaled by the golden ratio is the way they fit together. This is hard to explain but a close examination of the proportions in picture above pretty much says it all. Putting this into words sounds a bit incomprehensible, but I will try anyhow. : First, understand that scaling something means you are making something uniformly bigger or smaller by a chosen amount. 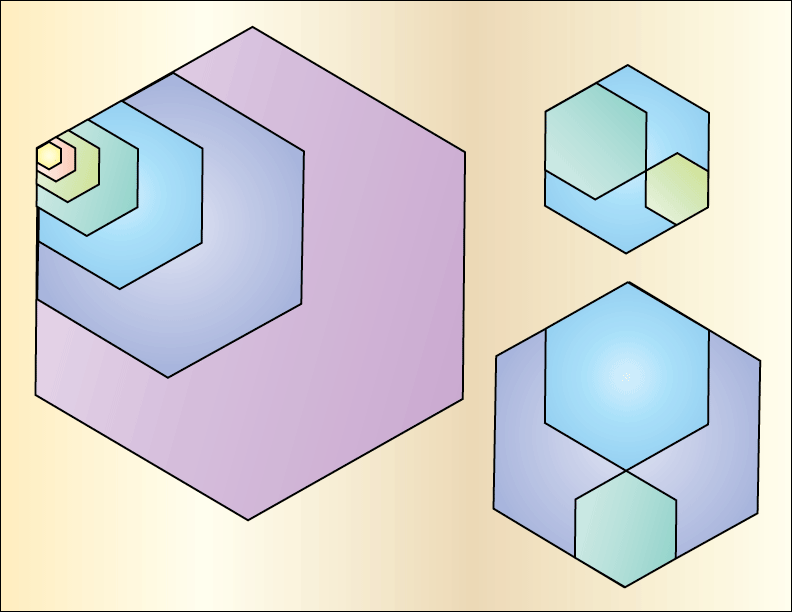 If there are three shapes scaled consecutively larger by the golden ratio,then the two smaller shapes will fit exactly into the largest shape. 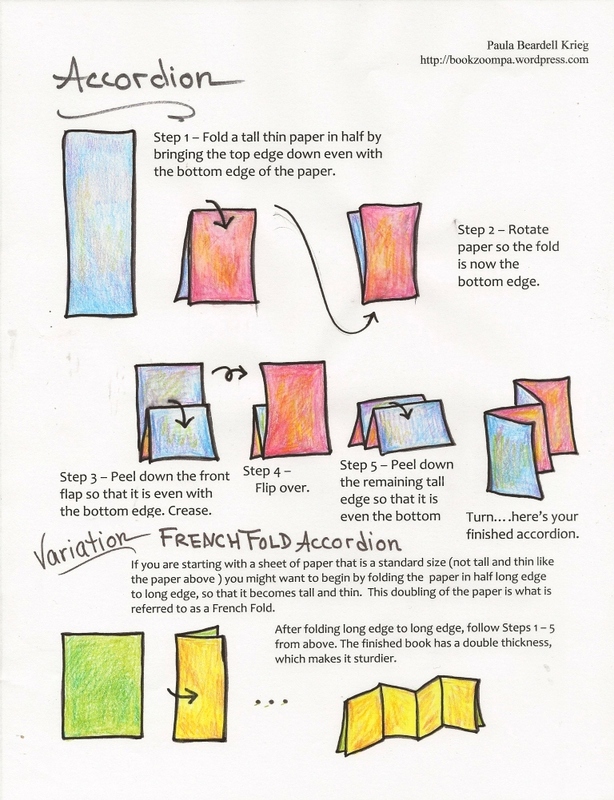 A few people who’ve seen these have commented on the beautiful papers that we used. I thought they meant the colors, which is bright copy paper. But now I’ve realized that people like the graphics on the shapes. These aren’t patterned paper, these are patterns made on my printer, printing with black ink. It was my way of easily distinguishing between the shapes, as all the same sizes have the same graphics on them. 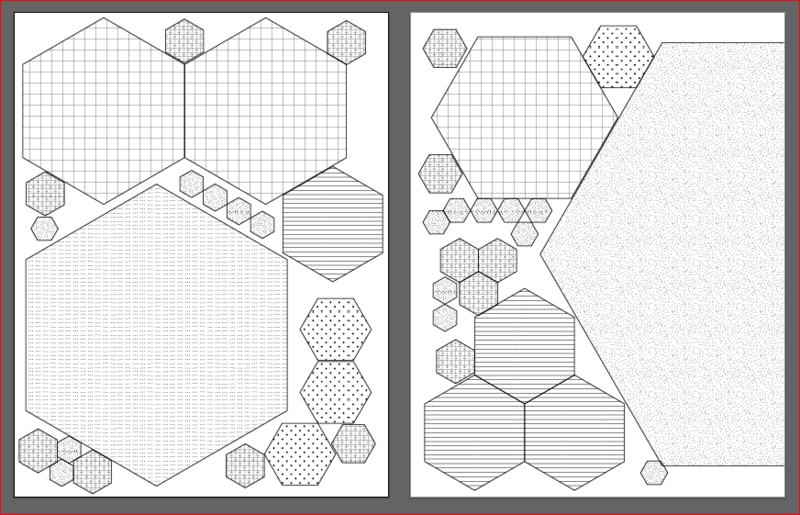 Sample of hexagon file on regular copy paper. 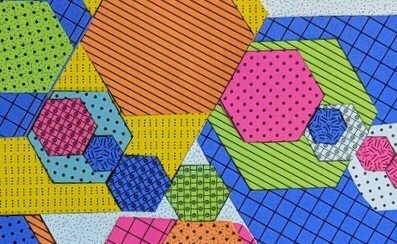 Since I have printer that makes 11″ x 17″ inch copies I printed from a file that has lots of hexagons in an 11″ x 17″ file. 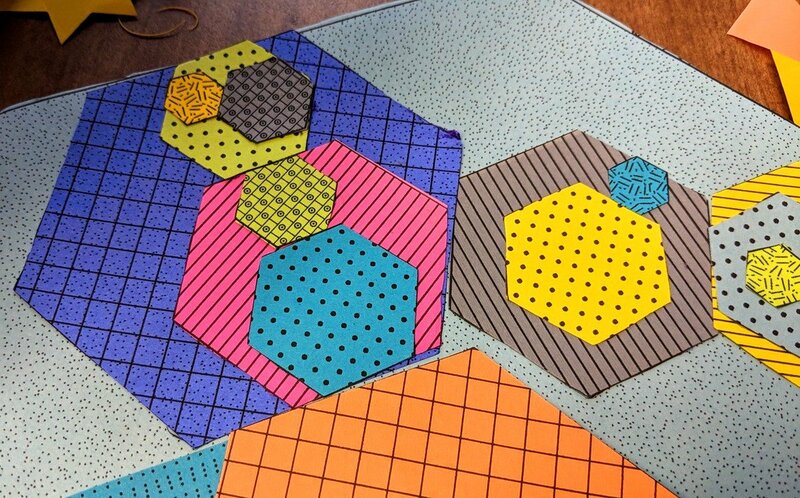 This gave me room to print a really big hexagon that I’ve been showing in the photos above. 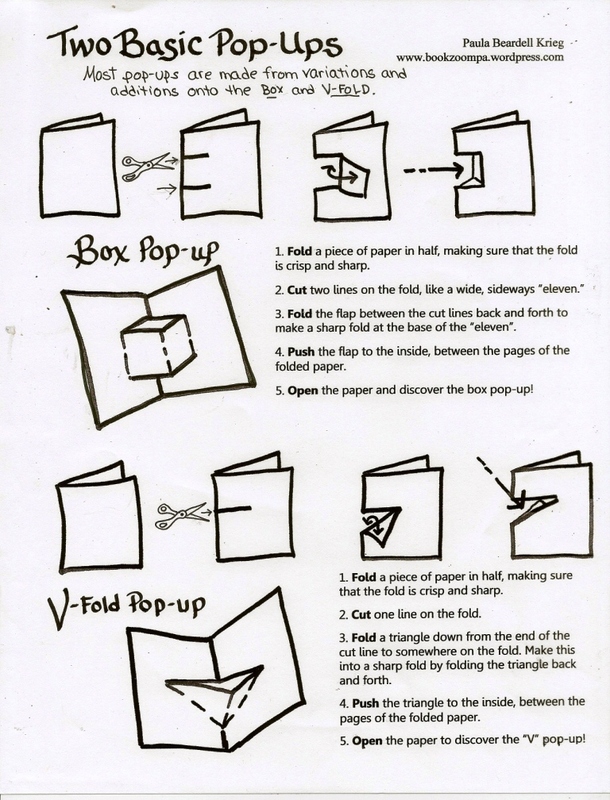 I know that many people don’t have access to this larger size, so I made a pdf for regular size copy paper. 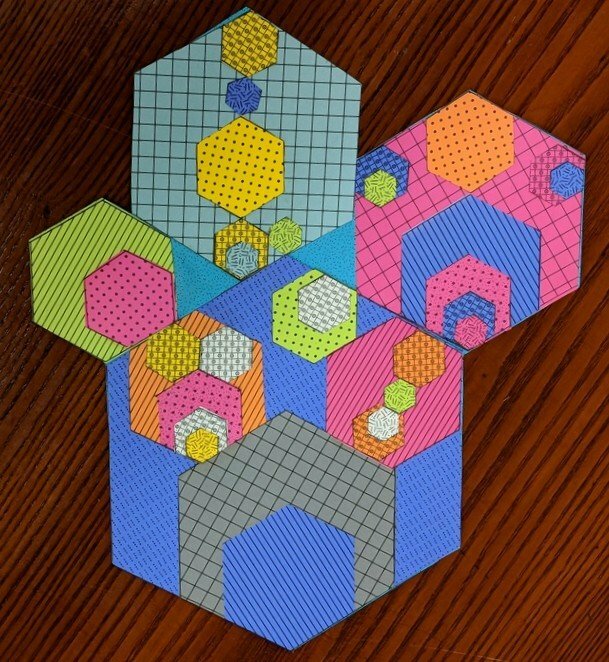 To get the largest size, I suggest cutting out the big half-hexagon, and tracing it twice on larger paper so you end up with a big, whole hexagon. And since Simon and Vince use A4 I made an A4 file. 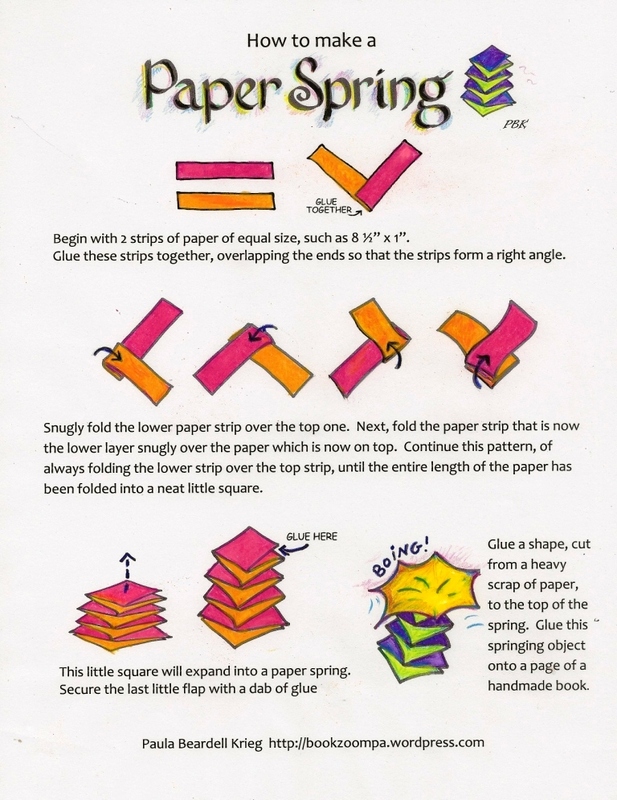 Here they are: use the files for the size paper you are putting in your printer. There is so much to notice in these pieces! First, people seemed to have a hard time feeling finished: the more they did, the more possibilities they saw. There are all sorts of opportunities to talk about equalities. Also, I noticed that equilateral triangles kept showing up. This isn’t something that we talked about, but it could have been. 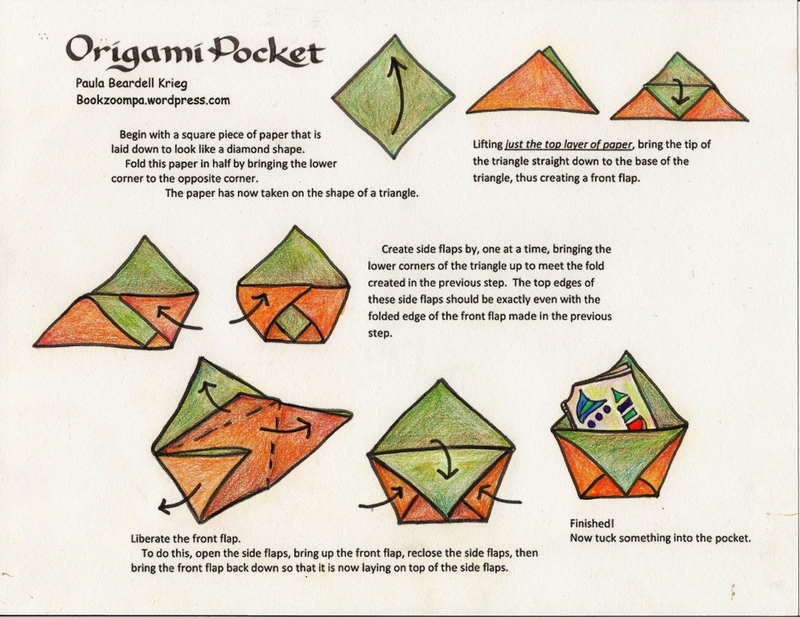 Oh, and see in the photo above how that green hexagon fits perfectly into the triangle? I tried to explain the golden ratio and its specific measurement and relationships to this little girl, but no matter how much I told her about the ratio which we call phi, and how the exponents -1, 0, 1 ,2, 3, 4, and 5 were sequentially applied to the base of 1.618 to achieve our shapes, and that she should be putting phi^1 and phi^2 into phi ^3 she chose to respond to every one of my helpful hints with the words “MY PROJECT!” Although there was ample opportunity for us to chat up the associative property, seeing that if a +b = c, and b+c=d. then a + b +b =d, she still hung on to her insistence of “MY PROJECT!” Obviously she is a renegade. Not everyone stayed with the program. The young lady above (3 years old) had her mother get her started in the right direction, but then she took off on her own, plotting her own course. 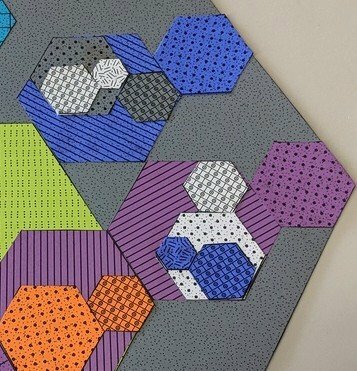 I like how this young person (she is 8 years old) decided to cut off the background hexagon. There are much more I could write about this project, but it’s really about discovery. So I will leave it at this. Just one last note: for gluing, we used glue sticks. 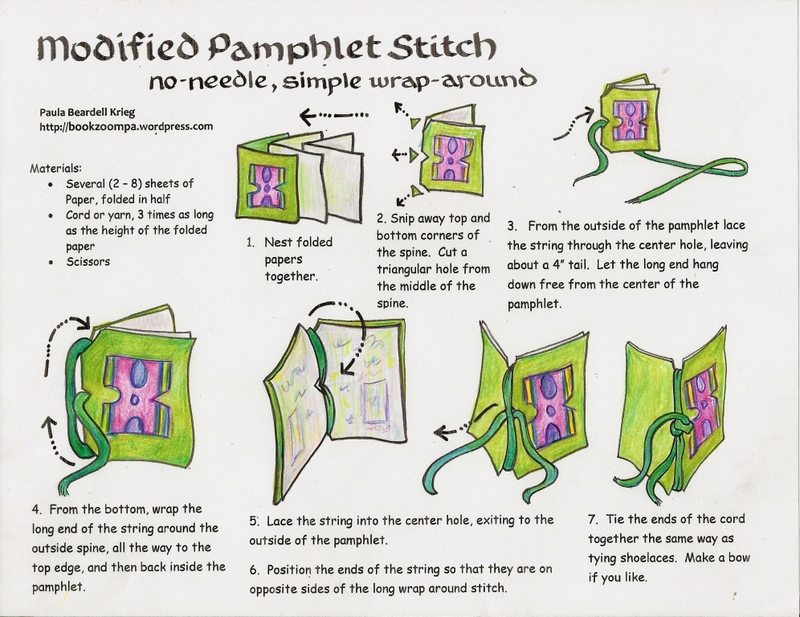 Previous Post Chinese Thread Book Workshop, so how did it go? Thank you so much for generously sharing this. I wish I’d met a teacher like you when I was 8 years old! Obviously she is a renegade.